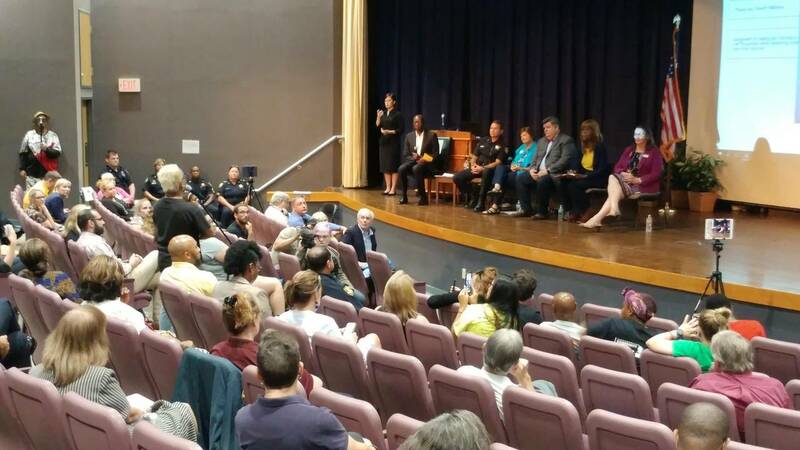 JACKSONVILLE, Fla. - Members of the LGBTQ community were able to voice their concerns about safety in Jacksonville at a meeting Thursday night with Sheriff Mike Williams. The community meeting comes after the shootings of four transgender women, three of whom died, in Jacksonville over the last six months. The sheriff admitted to the crowd gathered inside the auditorium at the Florida State College at Jacksonville Downtown Campus that his agency did a bad job of getting information out about the attacks. Williams also said the three transgender murders were not believed to be related, as there was no evidence linking the attacks. While the attacks were the focus of the discussion, there are many issues on the table, including safety and sensitivity. Williams recognized that by officially announcing the formation of the Jacksonville Sheriff's Office LGBT Liaison Team. There were mixed reviews about the meeting. Some said it was a step in the right direction, while others said they were disappointed and upset. At times, it got contentious. One group walked out, calling the event nothing but a publicity stunt that’s not really getting anything done. "First of all, the liaisons, they don’t consist of people like me. There should have been a transgender. There should have been a gay or lesbian person," said Paige Parks, with the Transgender Awareness Project. Parks, a transgender woman, told News4Jax she's not happy, calling Jacksonville homophobic and transphobic. "If you are moving to Jacksonville and you are transitioning, or you are LGBT, honey, please don’t come to the city. Go elsewhere," Parks said. Jimmy Midyette, an American Civil Liberties Union attorney and LGBTQ advocate, applauded the sheriff for stepping forward to form a coalition. "I can tell you, it really wasn’t a publicity stunt on behalf of the Sheriff’s Office, because it was really the community who went to Sheriff Williams and asked him to do this," Midyette said. "He was under no obligation to do it. But he did it without reservation." The sheriff appointed a board of 5 JSO officers to specifically work as liaisons between police and the LGBTQ community. "That’s huge," Midyette said. "We’ve never seen anything like that in Jacksonville in my time." In addition to forming the LGBT Liaison Team, the Sheriff's Office is also considering new training programs for the agency. Anyone who would like to speak with members of the LGBT Liaison Team can do so by emailing JSOLGBT@JaxSheriff.org.